This picture taken from an hypogeuum in Egypt shows a colorful wall with hieroglyphics and narrative images from a religious passage. 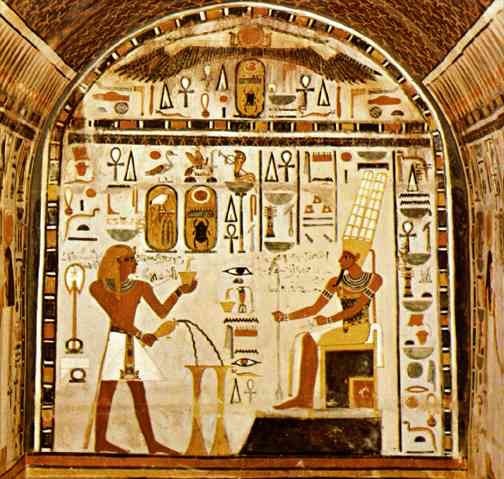 In ancient Egypt the walls would be used to illustrate a story that would be either religious or a descriptive anecdote about the death person which would also have a connection with religious expectations after death. The symbols represent words and sounds that express ideas and the images just illustrate this ideas. This was because not everyone would know how to write or read but Egyptians wanted to make sure everyone would understand, even the slaves. The images generally show Gods accompanied with animals or people that are part of the story.